The Funny Bone - Humor. When people hit their "funny bone," they are actually aggravating their ulnar nerve. The ulnar nerve is known as the largest, unprotected nerve in the human body. It is also the only unprotected nerve that does not serve a sensory function (smell, touch, taste, etc.). Not only is hitting your funny bone not funny, it causes pain and tingling sensations to shoot down your forearm. 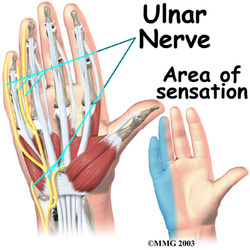 You experience pain where the ulnar nerve works, which extends down the forearm into your ring and pinky fingers. You get that painful but tingling feeling when the ulnar nerve is bumped against the humerus bone at your elbow (Humorous! Get it?). The ulnar nerve is trapped between the humerus bone and the overlying skin at this spot on the elbow. The funny bone's name is based on either the funny feeling one gets from bumping into it, or the similarity of the bone's name "humerus" to the word "humorous." So the funny part about the funny bone is that it's not even a bone at all.